Take exit 10 from I-89, continue on 100 N for 3 miles. Turn onto Reservoir Road and continue for .04 miles. Remote Camping: There are 27 remote campsites along the Waterbury Reservoir shoreline that are only accessible by boat. There is no charge for these sites and they are available only on a first-come, first-serve basis. The sites have privies but no potable water. View the Waterbury Center Remote Camping Map for more information. Hiking: A universally-accessible trail was created in 2010. Swimming: Waterbury Center State Park has a beach with a designated swimming area. Boating: Boats are welcome at the park. There is a boat launch, and canoes and kayaks can be rented. Fishing: Some of the fish species in Waterbury Reservoir include rainbow trout, perch, and bullhead. 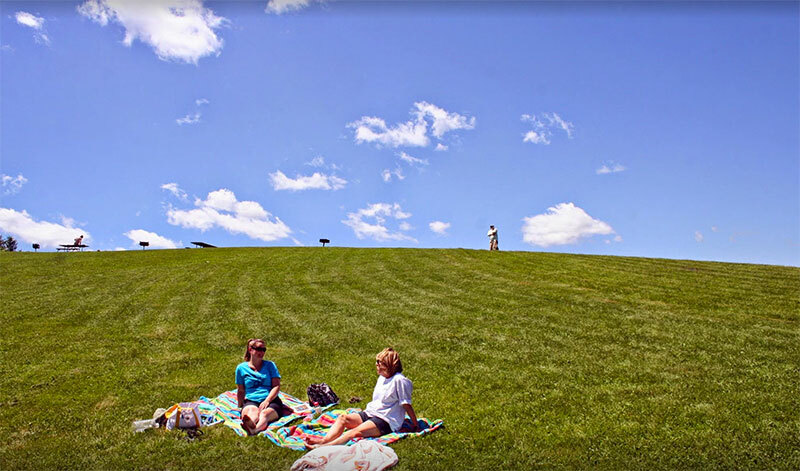 Picnicking: A great park for bringing a picnic lunch. Lots of grassy areas and picnic tables for visitors. Waterbury Center State Park lies on the easterly trivium of Waterbury Reservoir, a quarter mile off VT Route 100. It is an integral recreation resource in Central Vermont and one of the newer park facilities within Mount Mansfield State Forest. The Reservoir is the ninth largest body of water in the state of Vermont and was created in the 1930's by the CCC as a flood control project to protect towns and villages along the Winooski River Valley. From late spring to early fall the Reservoir is maintained to a surface area of 850 acres and has a maximum depth of 100 feet. To prepare for normal spring snow melt and runoff, the surface area is reduced to between 415 - 610 acres throughout the winter. The designed flood control capacity of Waterbury Reservoir is approximately 9,000,000,000 gallons. Waterbury Reservoir is also a great place to fish and free fishing gear can be checked out as part of the Reel Fun gear loaner program. A new, universally accessible trail was constructed in 2010 that includes two accessible fishing platforms. There are a number of remote camping sites located along the reservoir, available on a first-come first-serve basis. Please call Little River State Park for more information on remote camping on the Waterbury Reservoir.